Hands-on at E3 2018 with Destiny 2's upcoming PvE/PvP hybrid mode that will be coming to the game with the Forsaken expansion. The first two Destiny 2 DLC expansions have added new maps to the Crucible, but the game modes have remained the same. This will change with the release of Forsaken, which is adding an entirely new game mode, Gambit. Your first thought may be that this new mode will be something that we've seen before in a Call of Duty game or other mainstream shooter, but that's not the case. Gambit is a pretty unique mode - the closest analogous mode I can think of is Titanfall 2's Bounty mode, but there's enough different here that we'll say 'inspired by' rather than 'a copy of'. Gambit is a hybrid mode ' most of the time it's team-based PvE, but when things start to ramp up a PvP element kicks-in. Gambit pit's two teams of four Guardians against each other on separate maps in a race to summon and defeat a boss known as a primeval. The goal is to fight waves of attackers and collect the tokens known as Motes of Light that they drop. These tokens then must be deposited in a central vault ' if you die before depositing your tokens, you'll lose them all. When your team accumulates certain numbers of tokens, you can spawn an enemy on your opponents' map to make things more difficult for them. The more tokens you have before depositing them, the stronger an enemy you'll spawn on the opponents' map. These enemies are called blockers, because as long as they're alive no one can deposit tokens on the map they're invading. At higher levels you can open a portal which will allow one member of your team to warp to the other team's map and that's where the PvP part of Gambit comes into play. The Guardian on the enemy map can take out enemy Guardians to cost them the tokens that they're carrying, and to provide a distraction that keeps the enemy team from focusing on gathering tokens. There's a bit of strategy behind when to deposit your tokens, because if you hold them back you can instantly swarm the other team with multiple enemies, but doing so runs the risk of losing all of the tokens you've accumulated if you die before they are deposited. Once the primeval is summoned, the other team can portal in virtually at will. This leaves the team trying to cross the finish line to deal with both a massive boss creature and enemy players at the same time. At E3 I had the chance to try the mode myself. At the beginning you meet the Drifter, a new character in the Destiny universe. 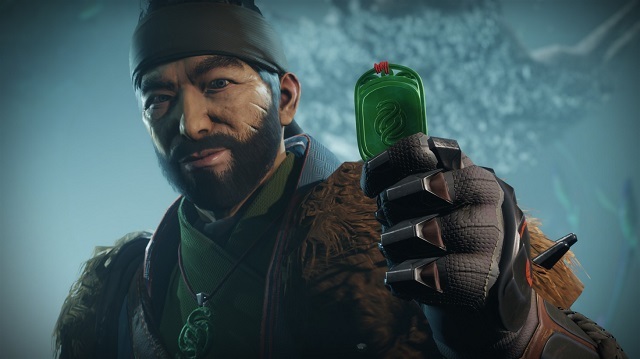 The two teams of Guardians stand facing each other in an arena like room as the Drifter flips a dogtag-like coin to randomly select the enemy faction you'll be facing. Once he announces your enemy, you're warped to the battle area which features a central circular colonnade with the vault at its center. You'll then hear a callout that lets you know where the next wave of enemies is attacking from. Once you clear each wave, you'll have a brief chance to deposit tokens before the next wave begins. At first the match felt like a purely PvE experience, a lot like a public event. Once blockers started to appear things became more hectic as our team had to refocus our efforts on the blocker while the incoming wave was firing at our backs. Jumping through a portal and hitting the enemy zone is a lot of fun ' especially if you take a stealthier approach, firing from afar with a bow or sniper rifle while the enemy team is focused on the latest wave. Once my team summoned the primeval it was pure pandemonium ' fighting enemy Guardians and a massive boss enemy at the same time certainly puts your skills to the test. Even though I only had a brief time with Gambit at E3, I can see that the mode will offer a lot of room for different strategies. It's something that's different than anything else Destiny 2 has on offer, and I'm looking forward to playing the mode more when Forsaken is released in September.